Never use furniture stripper again! 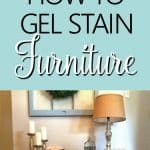 With this easy stain over stain technique, I share how to stain any surface and even how to gel stain over paint! Imagine yourself walking down the aisle of a thrift store and seeing a piece with serious potential! It’s in great shape and you even have the perfect spot picked out. There’s one problem… You know that dated, orange stain would be a beast to get off with furniture stripper! However, you don’t have to strip a piece of furniture to refinish it. 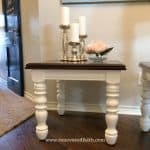 Instead, you can easily gel stain wood with this stain over paint technique to make old furniture look new again! “Paint Remover” is not in my DIY vocabulary. I can think of few activities more miserable than applying a noxious chemical onto a piece of furniture in an effort to scrape off every bit of old paint or stain. Fortunately, you don’t have to! Gel stain is an oil-based stain that is very thick and goey, almost the consistency of jelly. But don’t let that deter you! That gel consistency takes a little extra time to dry and that’s a GOOD THING. Unlike a regular oil based stain that is thin and watery, the gel stain gives you time to work with it to get the exact finish you want before you let it dry. 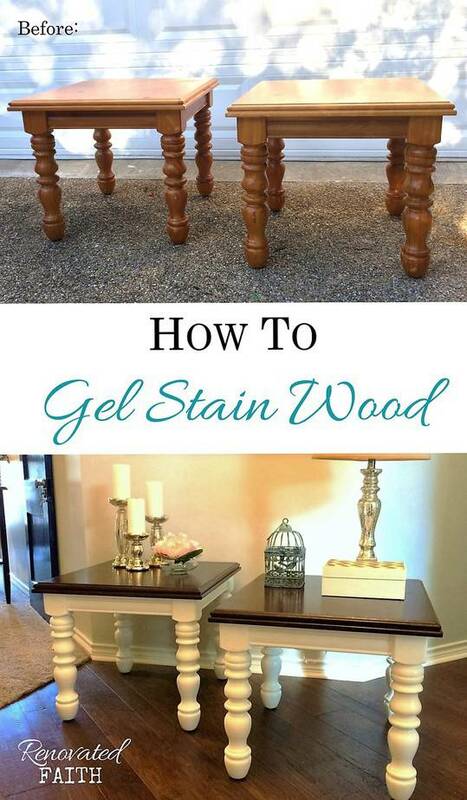 Another advantage of gel stain vs. oil stain is that traditional stain will penetrates the pores in the wood. This is great if you have a nice piece of wood or don’t have any wood filler in holes. However, with gel stain you can save money by using a lower grade of wood because it’s depth of color will cover any imperfections. Another nice aspect of gel stain’s consistency is the effect when a brush is dragged through it in one direction. The bristles automatically give the look of wood grain showing some of the warm tones of your base coat underneath. So when you open that can of gel stain to reveal a jelly like substance, no worries! It’s supposed to be like that and hasn’t gone bad. Also, a little goes a long way! After a lot of experimenting, I love the color and texture of Old Master’s Gel Stain in Walnut (check the current price here). It goes on beautifully every time! Gel stain is one of my favorite products because it allows you to re-cover almost any painted surface (even laminate and metal!) without stripping or sanding off the original surface. It’s easy to get the look of a dark, rich stain on a painted piece of furniture as long as you know how to use gel stain as a faux finish. 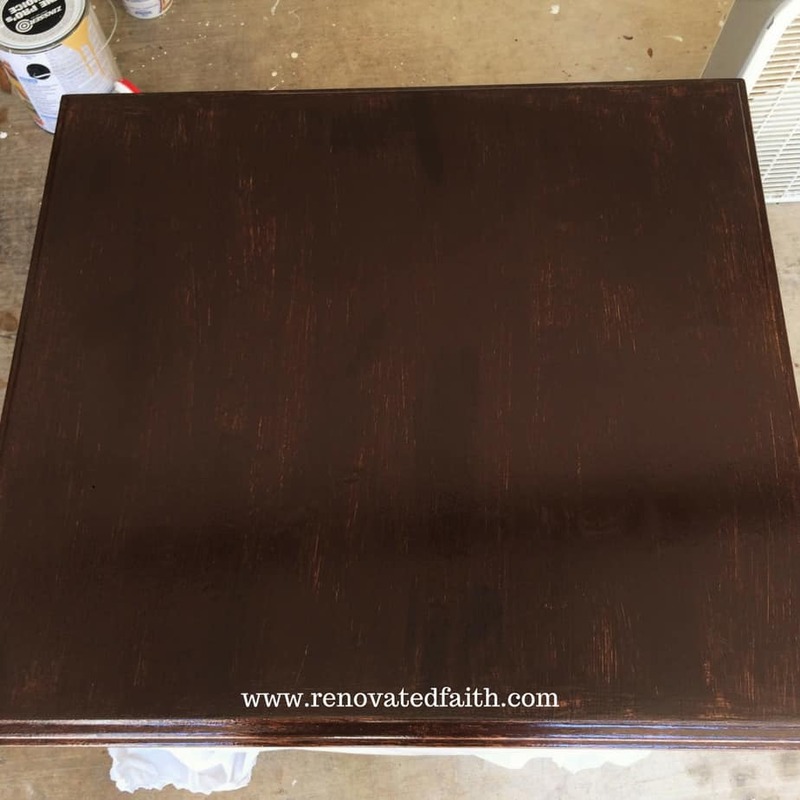 In this process I’ll show you not only how to apply gel stain to finished wood, but more importantly how to give a faux wood finish to any surface. GEL STAIN IS NOT JUST FOR DIYERS – This is actually the same process many high-end furniture retailers use because different cuts of hardwood can have different shades. Once, they assemble the furniture, the furniture doesn’t match exactly. Therefore, to have continuity in their final product, a gel-stain is used. Mouse Sander – I purchased this Genesis sander a few years ago and it has never let me down. Sometimes the price will go below $17 on Amazon. To learn more about sander buying options and reviews, click here. Fine(320) and Rough(180) Mouse Sanding Pads. Peanut Butter Shade of Latex Paint (I used Behr Glazed Pecan after lots of experimenting). Behr is Home Depot’s brand but if you are at another store, just ask if they can match it. They usually have the codes for other brands in their computer system. 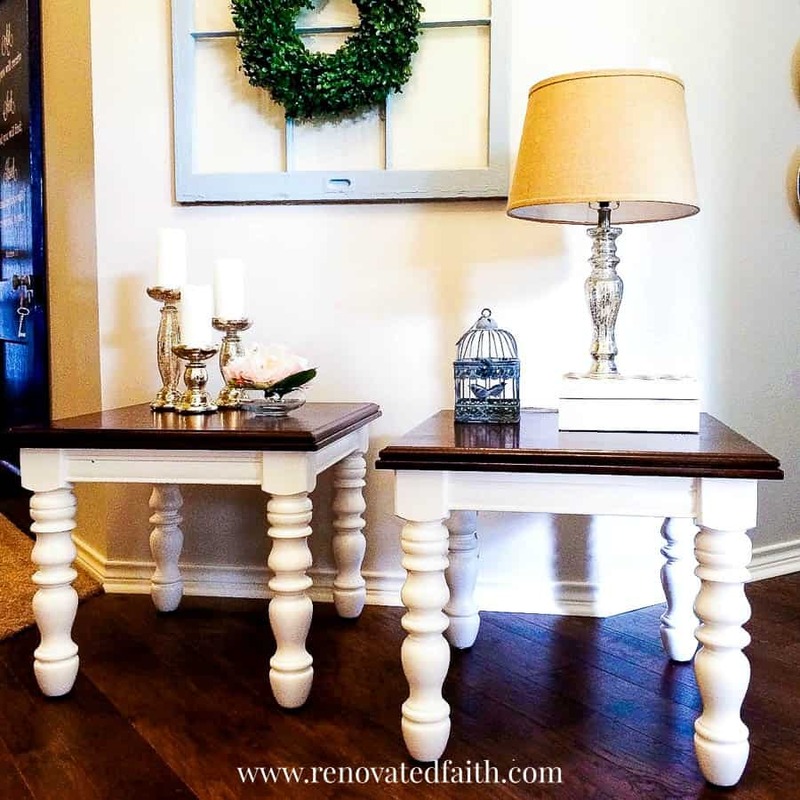 White Latex Paint for the Legs – I like Behr Premium Plus Latex. Floetrol – Great product to reduce brush strokes in paint! 2-3 Paint Brushes – I’ve had good luck with this set. Click HERE for Current Price. Click HERE for the best sanders for wood furniture. I eyed these two “beauties” on a Facebook page. Realizing they were solid wood and in good shape, I knew they would look like new by using gel stain to refinish the surface. You can see a funky inlay pattern and also some deep-set water stains. I decided to do my favorite combination of a dark stained top and white apron and legs. 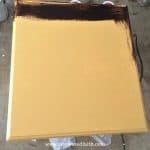 Applying Gel Stain Over Paint? 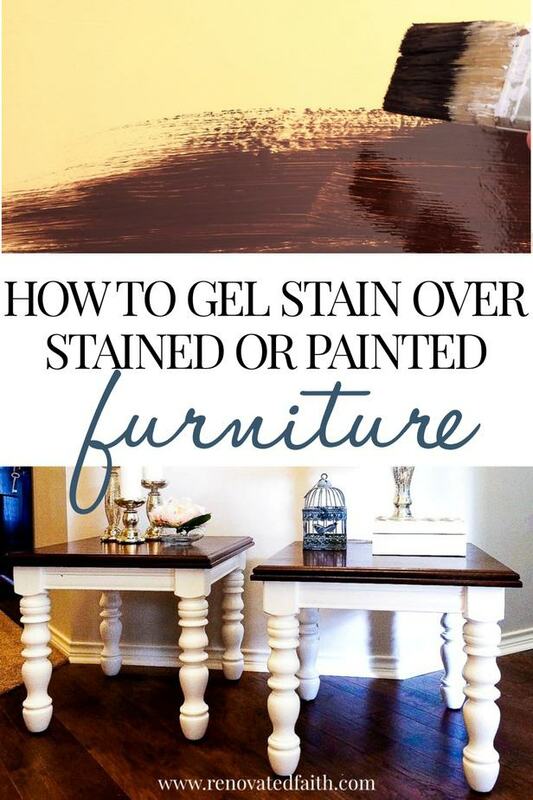 If you are wanting to apply gel stain over a painted furniture piece, you will use the same process as below for applying gel stain over stain. 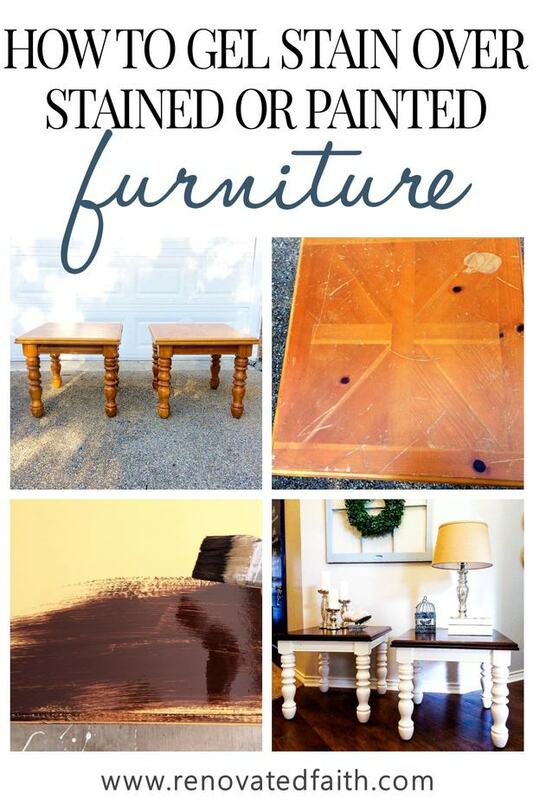 If you need some ideas on what shade of stain, click here: Stained Furniture Ideas. Before learning how to gel stain wood, the first step of any project is to make sure your piece is structurally sound. I tightened all the bolts underneath and would have added wood glue or wood epoxy if needed. Nobody likes wobbly furniture. Next, I sanded with my electric sander and a rougher sanding pad. Don’t sand to remove the old stain, you are just going over the surface to degloss it so it accepts the paint. You can see my post and video on how to sand furniture with and electric sander here. I wanted to get rid of any trace of the water damage and inlay design. I then wiped the table with a slightly damp rag to remove the sanding dust. To prime, I used Zinsser Bullseye 123 and painted on a THICK coat onto the tables. I’m a big fan of this product. It settles very well for a primer, leaving very few brush strokes, and it dries fast with little odor. Although it is water-based, it still blocks out the old stain and makes a good foundation for the gel stain to look like stained wood. I added Floetrol to my paint (according to the directions on the back) which makes the paint settle better, leaving fewer brush strokes. 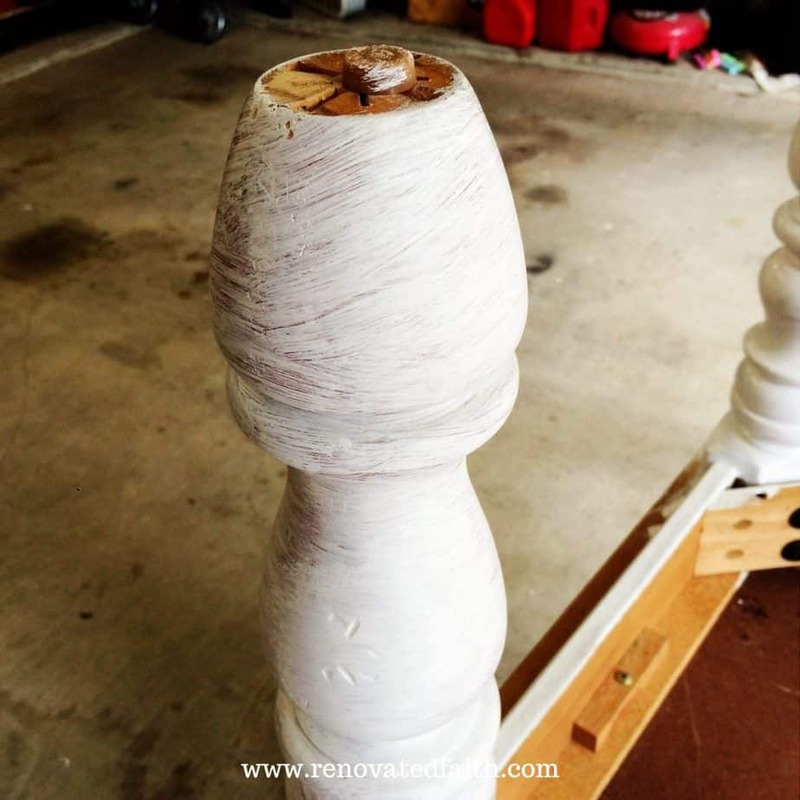 Normally, this isn’t a big deal because you can sand out obvious brush strokes but any kind of woodwork with spindles is not easy to sand. Because Floetrol also thins the paint some, it took me 2 coats of paint on the legs. If you aren’t a stickler about brush strokes, the Floetrol is not a must. Now you can apply a layer of your peanut butter colored paint brush in long strokes from one side to the other in the same direction. I used Behr Glazed Pecan in Latex Satin. This shade, although hideous, will serve as the base for your stain. 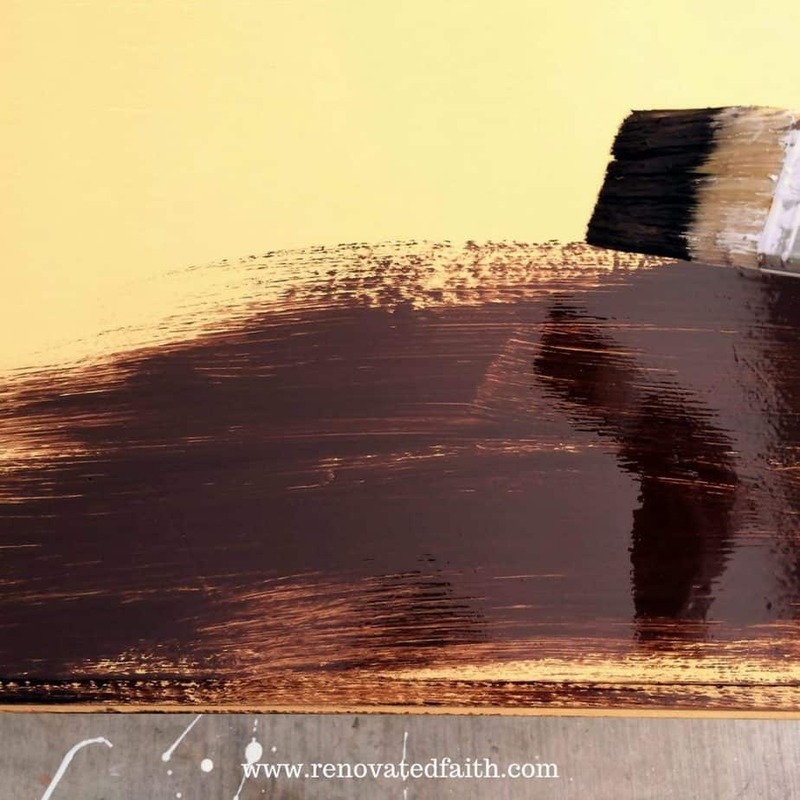 Where part of the brush strokes in the gel stain are slightly translucent (like the grain pattern in stained wood), you will see a little of this shade peek through. It took one thick coat of this. Notice I didn’t cover it very well but that’s ok; the surface will take on a completely different look, regardless. You have several colors and brands to choose from and below are links of where to buy gel stain in different sizes depending on your project. I personally like the consistency of the Old Master’s brand and used the color American Walnut that you can find here. Now is the fun part – applying the gel stain! Brush on the gel stain in the same direction as the base coat in long strokes. Your goal at this point is to cover every bit of the top with a good coat of gel stain. It doesn’t dry very fast so you have a few minutes to work with it. 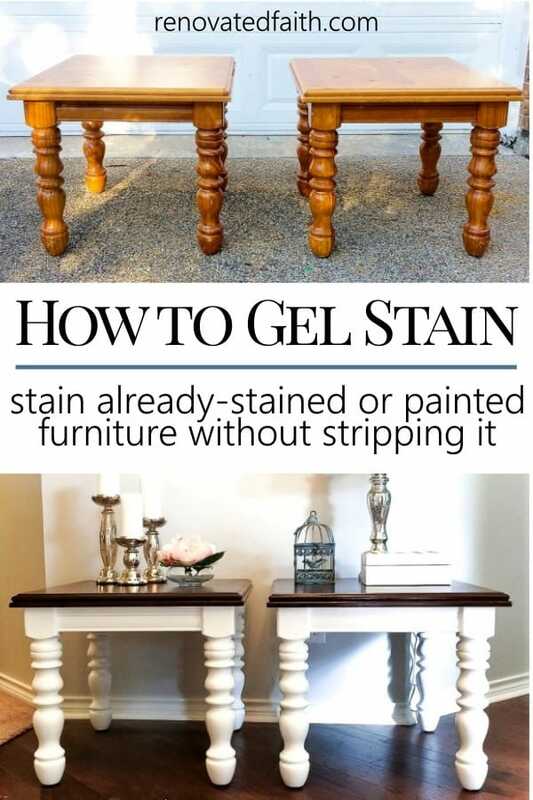 If you want your stain darker, add some more gel stain. The key is to work in the same direction to resemble wood grain. Once your gel stain starts to dry, you can see the final product. What do you think??? How Long Does it Take Gel Stain to Dry? Give your gel stain 24-72 hours to dry depending on how humid it is. The rule of thumb is that it needs to not feel tacky, but I would not touch it until after 48 hours. Here is how one thick coat of gel stain looks. If I would have wiped more off my brush, you would be able to see the “grain” a little more. It’s all personal preference and the gel stain gives you plenty of time to get the finish just how you want it! You can also do a second coat of gel stain after the first has dried for a darker look. Can you Polyurethane Over Gel Stain? I get this question a lot and it depends on the amount of use that your piece of furniture will get. Gel stain has a lot of the same properties as a clear coat like polyurethane so if it won’t get heavy use with LOTS of cold drinks sitting on it, I wouldn’t worry about a top coat. For furniture that is heavily-used, I would apply a couple layers of top coat like this wipe-on polyurethane. Add some of the wipe on polyurethane to a lint-free rag and just wipe it on until it’s smooth. Add another coat after 24 hours for extra insurance. 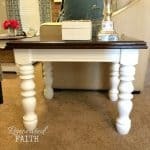 I used this same process on my turned leg coffee table and also in my post about how to refinish a roll top desk. 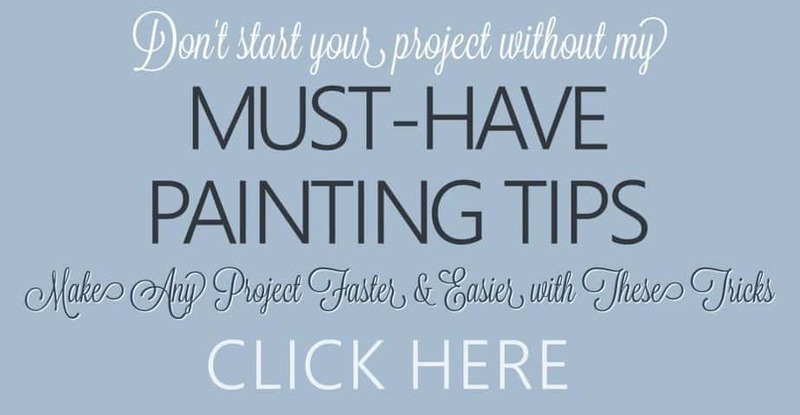 Click the graphic below if you like to download my FREE Must-Have Tips for Painting Furniture! I love that finish! You could even use this process to gel stain kitchen cabinets but make sure you use the right primer for kitchen cabinets beforehand. 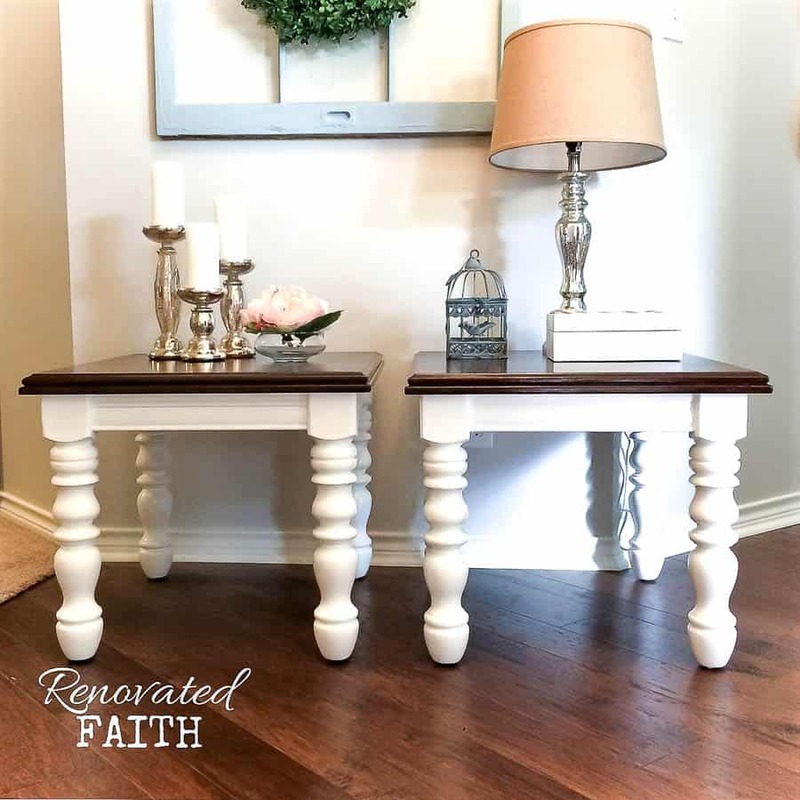 These tables underwent a major transformation and I’m happy with the results! I love my “project time” as it is restful and recharging in so many ways. As a time for me to zone out from the chaos that life brings. As I brushed the gel stain onto each table, I noticed how effortlessly the new stain covered, making a new surface instantaneously. The thick stain seeped into every nook and cranny embracing and covering every bit of the old raw surface. I watched as it restored the dated, worn-out wood to something fresh and new. I often fine myself reflecting on how God has transformed me just like whatever furniture piece I am working on. This is a beautiful picture of how God restores us to become who He always meant for us to be. When we come to accept Christ as our Savior, He wraps us in a robe of righteousness so we will no longer see the old stain of sin. Looking at the new surface, I no longer saw water stains and scuff marks, I saw a pristine reflection of myself in the surface. God is always faithful to make us into something beautiful, transformed and useful for His purposes when we seek Him. We often long to fix our broken places but in reality His grace fully covers them, like they never existed in the first place. 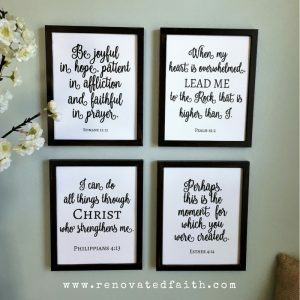 Every DIY or Home Decor post with spiritual encouragement has a Renovated Thinking section. You can see more of those posts by clicking here. 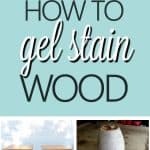 Can you gel stain without sanding? Several have asked me if they can apply gel stain without sanding furniture. As long as the furniture surface is smooth enough, you can get away without sanding. Gel stain is oil based and adheres really well with long-term durability. Does gel stain cover wood putty? This this paint over stain technique, gel stain will cover over wood putty and you won’t be able to tell it’s there. If you were to only use gel stain and not this process, you would see some of the wood putty’s color and texture through the gel stain. Can you gel stain over a painted garage door? You can gel stain over a painted garage door whether it is metal, wood or fiberglass as long as you use this technique with gel stain as other stains will not work. Also, be sure you are using the appropriate exterior primer for your work surface. For raw wood, with no imperfections you want to hide, just sand lightly to smooth out the surface and then apply the wood stain. You don’t have to add the paint because you aren’t hiding anything. Can You Stain Over White Paint? A few have asked me if you can add dark stain over white paint. In other words, they are wondering if they can skip the peanut butter color of paint and go right to the gel stain from a white primer or previously painted white surface. You could try it on the underside of the furniture. It might work if you are going for a very dark gel stain look but I wouldn’t recommend it otherwise. The peanut butter base coat gives it the look of wood as a white base might look odd. Can you Paint Over Gel Stain? If you try to paint over gel stain without prepping or priming the surface, the paint will be very likely to peel. Use the same prep process as described about where you lightly sand and then use a primer before adding paint. One thing Jennifer Allwood always says is “primer sticks to things and paint sticks to primer”. In other words, paint will not always stick to every surface so be safe and use a primer. Can you Gel Stain Kitchen Cabinets? 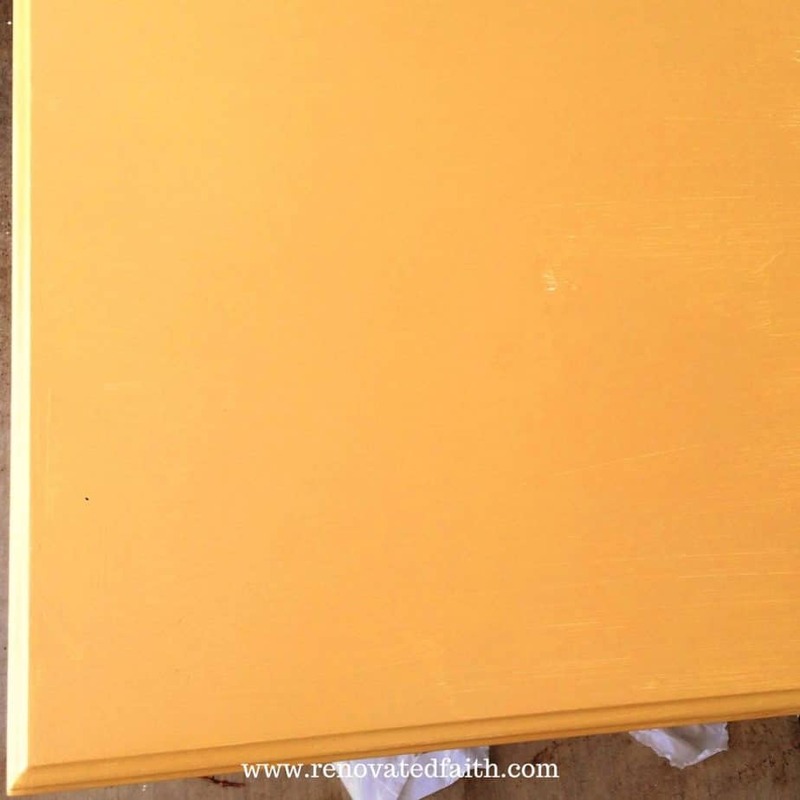 You can absolutely gel stain kitchen cabinets using the process described above. I would only suggest that when you stain the boxes, work in sections. in other words, pick a 4 x 4 foot section and do the gel stain process on it to ensure you get the look you want before it dries up on you. Then go onto the next section. Gel Stain is a very easy product to use but I wanted to make you aware of a couple things. When you first open the can, it might look like some dark brown jelly that was left in the fridge WAY too long. That is normal. Just get a paint stirrer and slowly stir it until it is all the same consistency. Gel stain is one of my favorite products in my DIY arsenal. I have gotten to the point where I no longer use regular stain even on raw wood. With gel stain, it’s easy to work with and I know how it will turn out every single time. 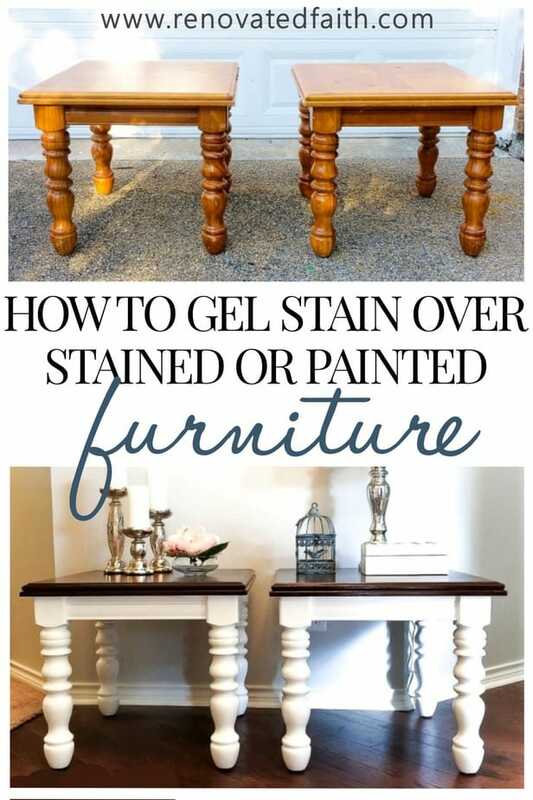 Now that you know about all the benefits of gel stain, I hope you feel empowered to refinish ANY piece of painted or stained piece of furniture you come across! They turned out beautifully!! Thanks for sharing your process. Thank you so much Andrea! I always appreciate your sweet comments! This process turns out beautifully. 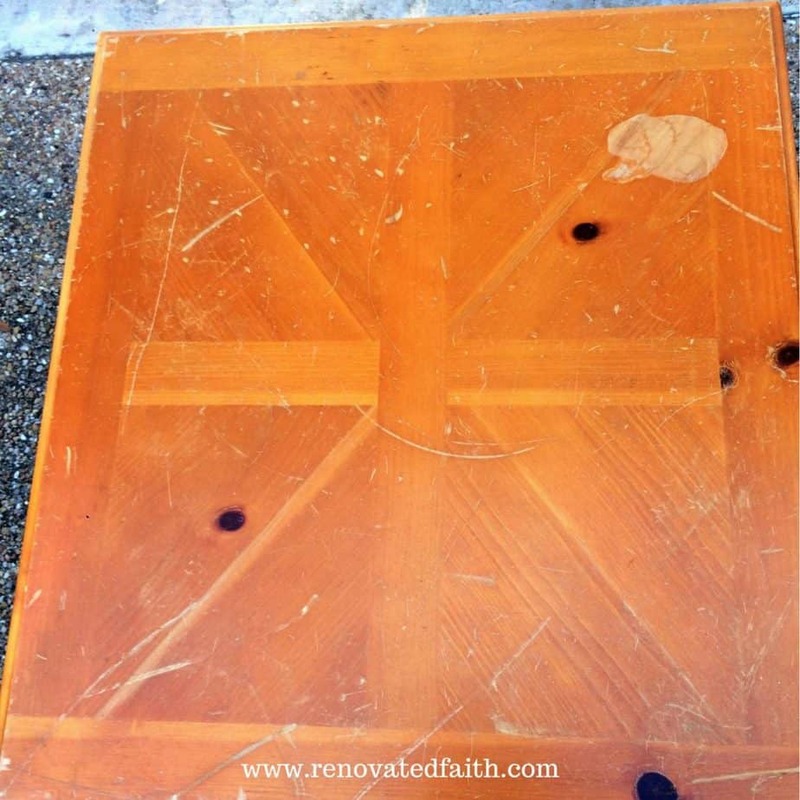 I have a Drexel 5-sided lamp table in pecan that needs the top refinished after 35 years of use. I would like the top a bit lighter to match the other tables in the room. Is this possible? The sides on this table are still like new. I wish I was closer so I could do this for you Robin. But yes, they have lighter shades of gel stain I believe. As long as it is gel stain it will work. Question, why couldn’t you apply the gel stain to the table top without painting it first? So glad you are using this process! It has never failed me. I have used it on our dining table, coffee table and several other projects. Thanks for stopping by! These came out beautiful! You say that gel paint can be used on laminate, is it the same process? Sand it first then apply the gel stain? 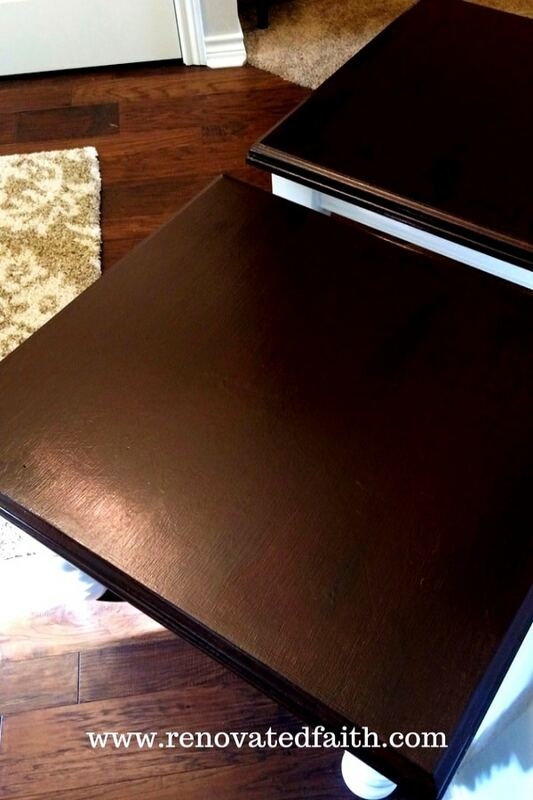 I bought a dresser and I want to do the same as these tables with the dark top and I keep reading that laminate cannot be stained. Can you help me with this question? Sorry it took me so long to get back to you. Yes, it can be used on laminate. You might want to sand more and use a primer like Zinsser 123 Bullseye (thick coat) before your base coat. I just used Gel Stain on some plastic picture frames and it worked really well. The gel stain would have no problem adhering but you just want to make sure the base coat (if you use one) adheres. Let me know if you have any other questions and thank you for reading! I truly enjoyed this tutorial, but even more so how you incorporated God’s love for us and how He desires for us to accept Jesus Christ as our Savior, into your work. I was struggling with something this past couple days, but it’s only through Gods love that I happened upon you on Pinterest. This totally helped me in my decision and I am so very thankful. I have just started upcycling furniture and recently shared with family and friends, via FB, my first ‘Passionately Painted Piece’. And in that post, I too wrote how painting helps me in finding relief from a stressful day. Your piece is beautiful and so are you! Thank you and may God continue to help you in sharing with others your beautiful work and His word! Your encouragement means more to me than you know. Thank you so much and I hope the furniture you work on provides you with some time to relax and enjoy God. Thank you again Sharon! Thank you such for this tutorial…I have found my new love and enjoy up cycling furniture…my nap time unwind time. ? Also, I love the comparison you made about how God has cleansed us from our sins and made us into something new! Amen! I truly understand the concept of naptime unwind time. Thank you for your encouragement which means more to me than you know. Thank you for stopping by! I am working on a piece using this process now. I am putting it on veneer which the Minwax can says is ok. However, it’s been 24 hours since the gel was applied and it’s still tacky. Since I knew I would put two coats as you did, I made sure not to put the first coat too thick. Any advice? Thanks. You did it right Wanda! Just wait until it’s not tacky, maybe another 24 hours. It just takes that gel stain a long time to dry. Karin, thanks for replying so quickly! I was beginning to wonder if I should remove and start over but I’ll just wait it out. The piece is looking really nice so I wanted this to work. I want to try to refinish my coffee and end tables but have been afraid to start. I have never refinished any furniture but you made this look so easy that I hope to start after Mother’s Day. I do have a question about the polyurethane, I have no idea what kind to use as the tables get a lot of use and I don’t really want a shine, do you have suggestions for me? Carmen, first of all, I’m so sorry it took me so long to reply. You have a great question about the polyurethane. I understand being nervous about staining as I was the first time I used the process. Fortunately, this type of staining is very forgiving. I used MinWax Semi-gloss Polyurethane. The first time I used this type of process was on my dining table. I did not sand it very well and the surface was kind of rough, which was fine. The problem was when I used a satin polyurethane… All polyurethanes start out as full gloss and then the company adds an additive to dull down the shine. The problem with all the unevenness is that the additive was settling in the lower bumps and it looked really weird. Fortunately, I put a coat of semigloss on top and it “fixed” the finish. So, I say all that to say that I feel safer using the semi-gloss although in a perfect world I prefer satin. Also, on my table, I used 6, yes 6, coats of poly. because I wanted to be able to set whatever glasses I wanted to on it without worrying about rings. With that much poly., I felt like the layers of satin would look cloudy after a while. So, my point is that, if you do one or two coats of polyurethane, I would feel confident using the satin. If you do more coats than that, I would use semi-gloss. Honestly, my semigloss pieces have dulled over the last couple years and now look satin. Either way, make sure you sand well. Does that answer your question? Feel free to ask any others and feel free to practice on a piece of wood if that would help you feel more comfortable! Thanks for reading!!! Your tables turned out beautifully! 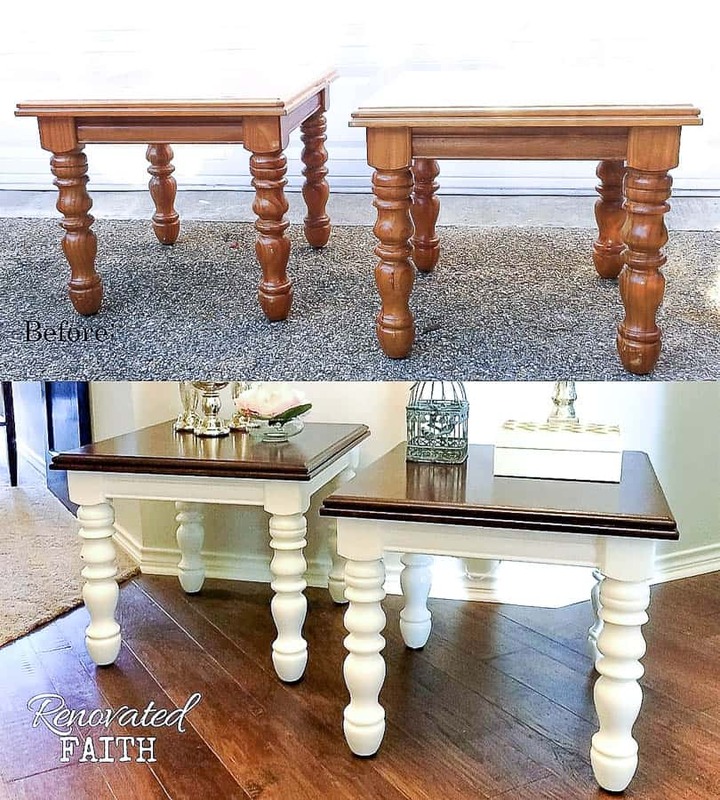 This is probably a silly question, but I’m new to the furniture refinishing process so forgive me…..did you sand and prime the table top and legs?? I know you must sand before using the gel stain (for the table top), but I’m not sure if it’s the same with latex paint (for the legs). Thank you! That is not a silly question AT ALL! The legs were really glossy so I put a thick coat of primer. I sanded just a little by hand because its so time consuming to sand curvy legs. I think the key is thick primer. For the legs and the rest of the table, I just used latex paint after the primer. Thanks for reading! Out on my project. You covered the instructions well. I am going to give it a try. I have been afraid to buy those bad stained pieces at a garage sale, but no longer…..wooho! So glad to hear that! Yes, this method opens up a whole world of possibilities! Thanks for reading! Great question Ashley! It depends on what look you are going for. The gel stain is very thick – think pudding consistency. So, you are not going to get a subtle transparent look in the places you add the gel stain. Regular stain is much thinner and might be a better fit depending on the look you are going for. I hope that helps! Let me know if it doesn’t. I have been looking for something like this. I was gifted a light wood changing table, and the rest of the room has dark furniture. Do you think it could work for this application? The changing table is in great shape. Do you think I would need to sand it or could I simply put the gel stain over the current finished table? I would sand it a little bit so the gel stain “sticks” a little better. Then just wipe it down with a damp cloth and you are good to go! Thank you for stopping by. There are so many whites to choose from for the legs? I like what you chose. Do you remember what the name of the white was? Also, I can’t find the Behr Glazed Pecan at my HD. Do you know if they changed it, and if so what it is comparable to? Thanks! Such great questions. Go to the desk at Home Depot and ask them if they can match your paint to Behr Glazed Pecan. They should still have it in their system even if it isn’t with the paint samples. Also, I used Behr pure white for my white. Let me know if I can answer any other questions Bridget! 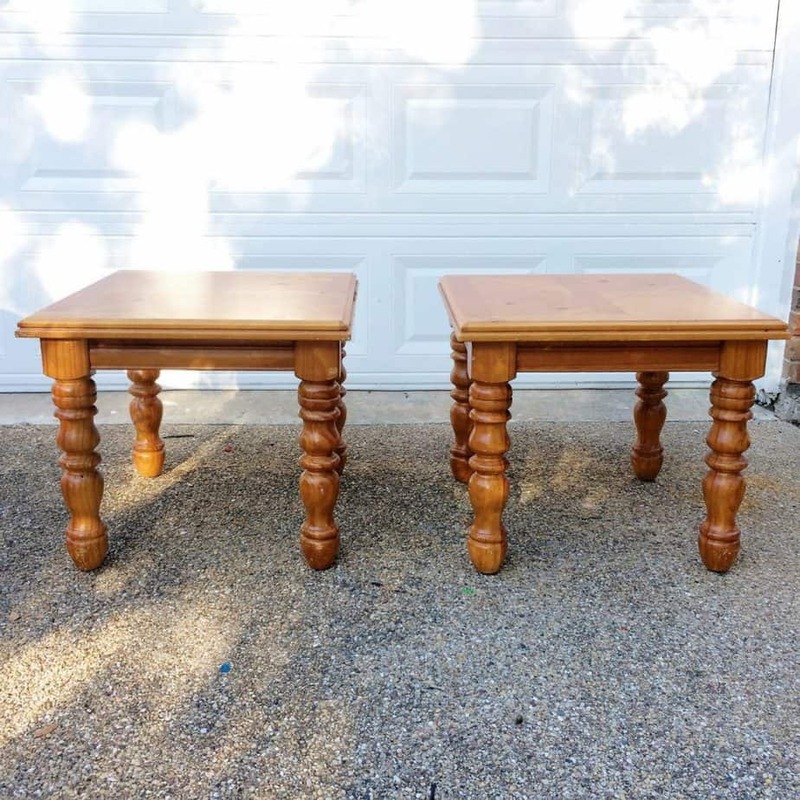 I HAVE A 2 END TABLES AND A COFFEE TABLE I’AM REDOING….I STAINED THE TOPS BUT WOULD LIKE THEM DARKER, CAN I USE JELL STAIN OVER THE TOP OF THE STAIN TO DARKEN THEM? ALSO CAN I USE STAIN TO ANTIQUE OVER THE BASE OF TABLES THAT I’VE ALREADY PAINTED OFF WHITE? THANK YOU FOR YOUR TIME…..BEAUTIFUL WORK! Yes, you can use it over the existing stain to make it darker! Gel stain is such a versatile product. It’s wonderful! I have not used it for antiquing but I think it should work well. I would test a small area first. Thanks Julie! My sofa table is laminate on top would gel stain work on it as well? It sure will. I would just sand it down a little before. Thanks Melissa! I love the way you finished these tables. I have a dining room table that I want to finish to look very similar. The top has a veneer and I accidentally sanded through an area during prep. I have used wood putty to fill the hole and then sanded it. I then used GF Java Gel for the stain, but the coverage was terribly splotchy. Seeing your tables, I think that applying Zinsers, with a base coat of paint b4 using the Java Gel may be my solution. 🙂 My question is…why did you used that particular color (Glazed Pecan) for your base coat? Was it because it was close to the original color of your table….OR….is it because it is the “perfect” color to use under Java Gel to get the result you were after. My thoughts are that any color as the base coat will do….but, I thought I’d ask. Thank you so much Angel! I used the Glazed Pecan because it seemed to work best. I used a yellower base coat color the first time and it just looked out because the lighter parts of the faux grain just looked too light and yellow. So, the Glazed Pecan is as warmer, color with more brown/orange and it seemed to simulate the look of stained wood better. I hope that helps and thanks for stopping by! I want to go from a cherry stain on dining room table to a honey or lighter stain. Is that possible without sanding or stripping? Hmmm…It is probably possible but I just don’t know how to do it. You would have to do the primer and a base color similar to my method but then different colors for the base and top “gel stain” layer. It might just take some experimenting on some old pieces of wood. Sorry I’m not more help! I am refurbishing a pine end table, and this is the look I’m going for:) So I’m wondering, do I have to do a base coat in glazed pecan? Can’t I just sand it, prime it and then use gel stain? Hey Jo! Great question. You notice how when you look at a piece of furniture with a dark stain, you can see “streaks” of brown but then lighter streaks of brown/gold underneath slightly. The pecan glaze base coat gives you those golden undertones that make it look more like wood grain. Let me know if I can help in any way! I am so happy that I found your you…. I have been wanting to do my Mothers old end tables . 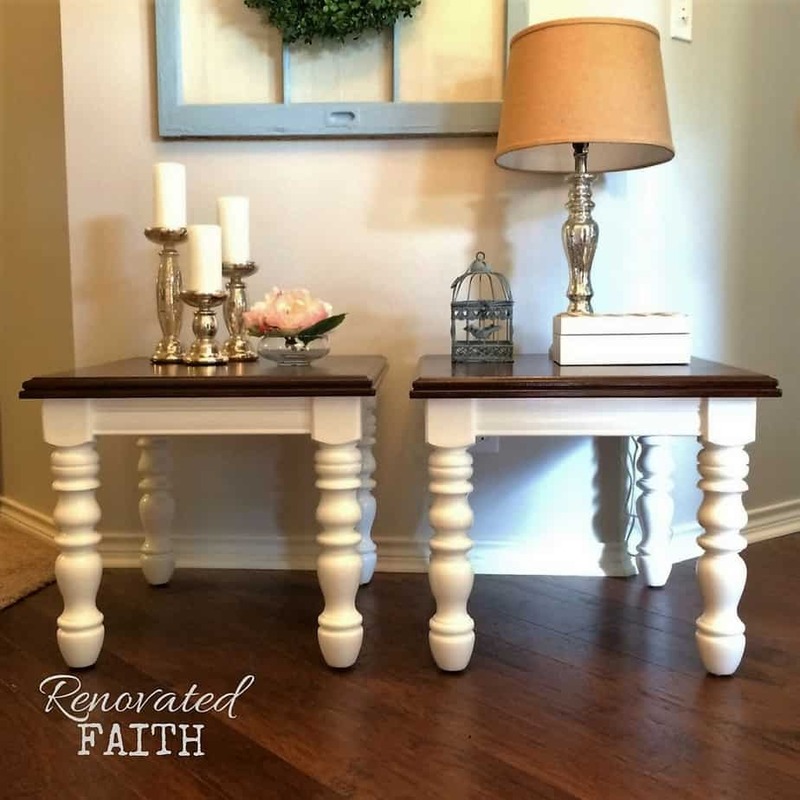 The end tables are exactly like the pair you refurbished . My Mother passed away in January. When my family and I were cleaning out my Mothers home, the family wanted to throw them away. I wanted to save them and do something grand with them and thanks to you I will be able to keep more of my Mother with me. I am thinking of trying this with my family room furniture that is good quality from Pottery barn, but painted a mossy green. I want to use a dark espresso color gel stain on the top surface. Do you think I need to paint the surface with a brown color first or would the stain look ok over the green paint (after sanding)? Hey Kris, I’d do the shade I mentioned underneath the stain. Otherwise you will see the green through the gel stain as it is a little transparent. Let me know if you have any questions! Thanks! I have an oak hutch that I want to transform but not with paint. Do you think this gel would work for a larger project like this? I think so, I would sand it lightly first. If the oak is all the same shade, you don’t have to do the primer/base coat. You might test the gel stain on the bottom of the piece to see how you like the look. Thanks for stopping by! Hello! Thanks for sharing this wonderful project. I have a dining table, coffee table, and two end tables and I want to stain the tops of. How much stain do you think I would need to do all of these? Great question. A quart of gel stain will go a really long way and it will last you for dozens of projects, if not more. Thanks for stopping by and let me know how they turn out! Can I use the General Finishes Gel Topcoat on the painted legs as well? I used white chalk paint and if I stick my finger nail in them it scrapes, after 8 hour dry time, I want to seal it up. And hope that alleviates the issue. 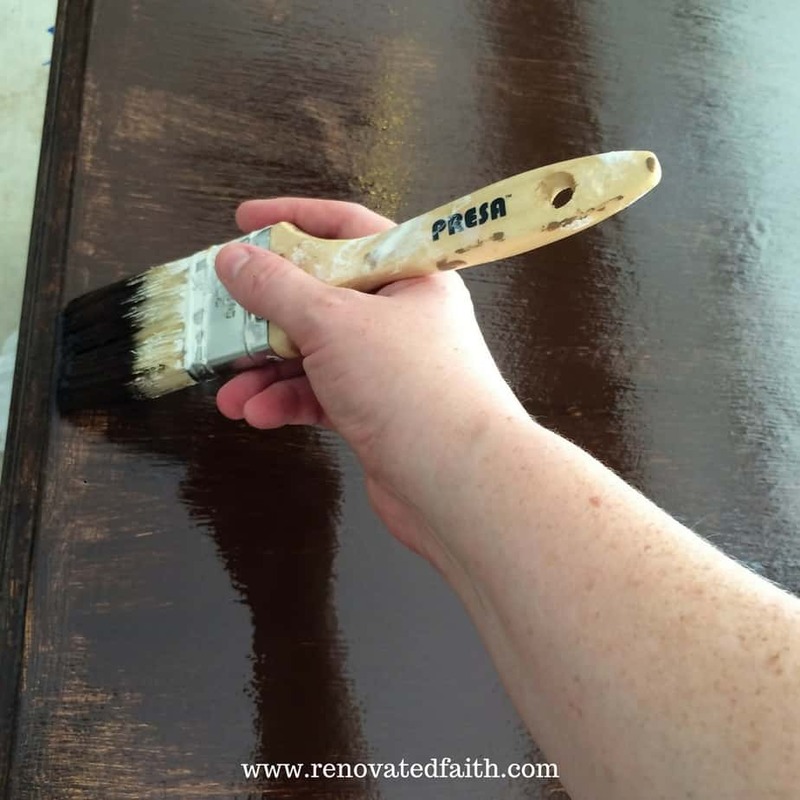 Great question…the General Finishes should make the chalk paint more durable! You might want to add a couple coats for extra insurance. Thanks for your question and have a great New Year! You are in the right track. It is streaky with the first coat. The second coat will look great! It will take at least 24 hours to dry enough for the second coat. Wait until it’s not tacky.